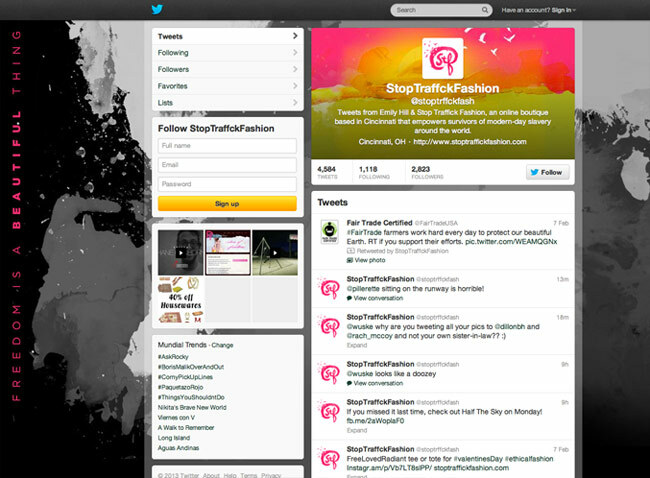 Stop Traffick Fashion supports human trafficking victims by selling clothing and accessories made by survivors. Their new brand features a very real and earthy look, using tons of paint splatters, which we utilized in their new Twitter background and header image. The mostly black and white background complements the vivid header photo that features a bright painted scene. Their tagline is also featured in bright pink on the side where it can always be seen.